Home » Blog » Happy National Dental Hygiene Month! October is commonly recognized as the month packed with pumpkins, scarecrows, trick-or-treaters, and all things Halloween. At our dental office in Warsaw, October has another important meaning that’s near and dear to our hearts; it’s National Dental Hygiene month – when we recognize our dedicated dental hygienists and bring awareness to the importance of proper oral health. 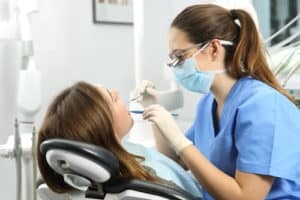 The hygiene team that works closely with your dentist in Warsaw is dedicated to educating patients on the importance and proper techniques of these four crucial activities for a healthy mouth. Let’s take a closer look at each one. At our Warsaw dental office, we would love it if every one of our patients would brush their teeth after eating. But we understand that’s not always possible. Instead, we encourage patients to keep sugarless gum handy and chew it after meals. Chewing gum helps produce saliva, which then helps neutralize and rinse away bacteria left over from lunch. Just make sure it doesn’t contain sugar and look again for the ADA Seal of Acceptance.